Traditionally to prevent someone from using a trademark, one had to claim that it was causing confusion with an already existing mark. i.e. the ‘misrepresentation’ claim. However, now days even the Trademark dilution view is given merit. Trademark dilution is a claim which the owner of a famous trademark can make to forbid others from using a mark that reduces the value or distinctiveness of the famous mark. Imagine if there was a watch being sold with the trademark ‘PEPSI’ or mineral water with the mark ‘ROLEX’. Now, there would obviously be no confusion that the mineral water was not associated with the ‘ROLEX’ brand of watches. But if people start ROLEX mineral water, ROLEX restaurants, ROLEX publishers then the distinctive value of ROLEX brand will diminish. The exclusiveness and excellence of the brand will be associated with all the other good or services using the trademark ‘ROLEX’. amendments in the Canadian Trademark Act. In the Victoria’s Secret Case, the plaintiffs claimed that a chain of lingerie stores called ‘Victor’s Little Secret’ was tarnishing the ‘Victoria’s Secret’ brand. Due to absence of a legislation on Trademark dilution, an injunction was not granted. In this case the plaintiff could not prove dilution. However, by virtue of TDRA proof of dilution is not necessary to claim dilution, the likelihood of dilution is sufficient. In Louis Vuitton Malletier S.A. v. Haute Diggity Dog, LLC, 464 F. Supp. 2d 495, 504-05 (E.D. Va. 2006), defendant’s goods ‘Chewy Vuiton’ were held to not be dilution of ‘Louis Vuitton’ because it was merely a parody of ‘Louis Vuitton’. The case can be found here. In Levi Strauss & Co.v. Abercrombie &. Fitch Trading Co. 633 F.3d 1158 (9th Cir. 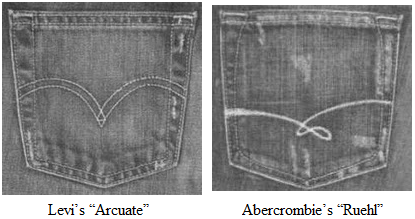 2011) use of the ‘Arcuate design’ stitched on the pockets of the jeans was registered trademark of ‘Levi Strauss’ was held to be diluted by Abercombie & Fitch’s ‘Ruehl design’. 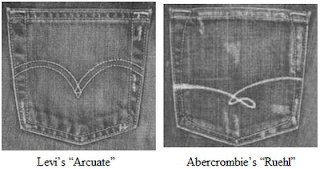 Levi Strauss lost the case but an appeal is still pending.